Fill in your details below and we will let you know within 24 hours if we can get Air Deck: Red to you with haste! 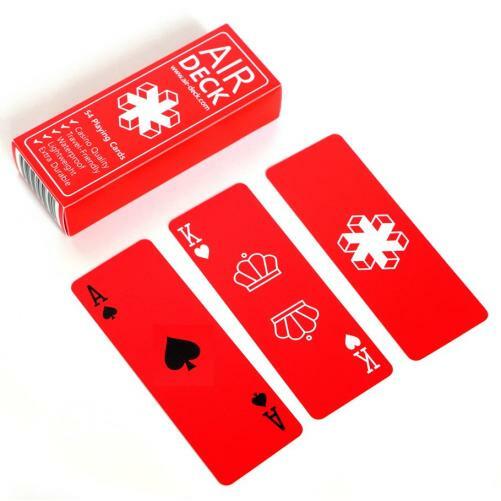 Air Deck is the ultimate playing cards for travelers. These professional grade cards handle very well, takes up little space and fits easily into your pocket. With the Air Deck, you can play everywhere anytime, whether playing on the train or on a play tray table. While regular paper playing cards tear, stain, bend and break easily, the Air Deck is incredibly resistant to abuse, and 100% waterproof. The minimalist design combined with the unusual form factor will make the Air Deck a surefire conversation starter on your travels.